One of the best known herbs. Likes a sheltered but warm situation. Pale blue flowers and fine aromatic leaves have many uses, but most often used with roast lamb. 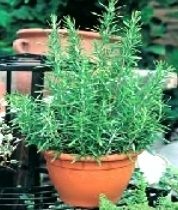 Rosemary (Rosmarinus officinalis) is a woody, perennial herb with fragrant evergreen needle-like leaves. It is native to the Mediterranean region. The fresh and dried leaves are used frequently in traditional Mediterranean cuisine as an herb - used in flavouring meat or fish dishes, also for Bouquet Garni.